Just 4 weeks ago after planting starts. Bolt top 4' board first, in place, after setting 8' boards. 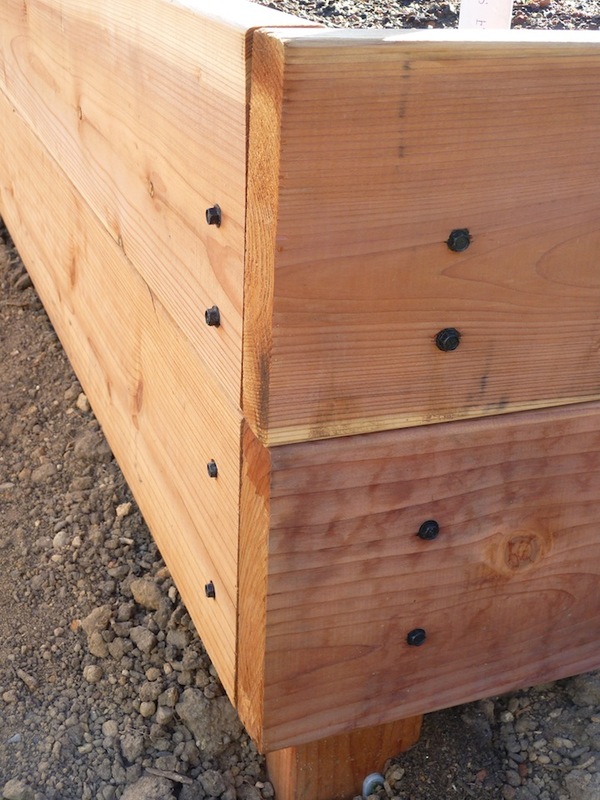 We used 4 inch timber screws for fastening. Place gopher wire on bottom. An inside brace prevents warping. Put down weed cloth and fill box with organic garden mix. With record heat around the country, it's hard to think about a fall and winter garden. But since our vast landscaping project prevented me from having my usual summer garden, I'm particularly excited about planting now. Especially since we just finished building new above ground vegetable boxes! if you set the 4x4 18" into the ground and go to the top of the box, you'll need almost 16 feet. If you just set the raised bed on the ground with the 4x4 running flush with the bottom and going all the way to the top, you'll need 7 feet. If you set the raised bed on the ground and have the 4x4 run flush with the bottom and go 2 inches from the top, 6 feet will do. See discussion below. I'm sure there are many ways to do this but this is how we built our 4 x 8 box. All boards are fastened to the 4x4 posts. You need to make some structural and cosmetic decisions before cutting it. * Remember when measuring the length of the 4x4 posts, the box is 2 boards high. 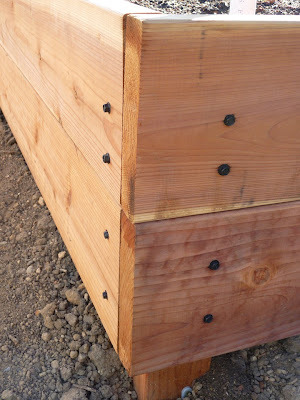 Each 2x8 is around 7 1/4 inches high so your box will be about 14 1/2 inches in height. Be sure to measure your lumber as size varies with different lumber suppliers. * Do you want the box set into the ground for stability? If so, cut the 4x4 long enough to extend into the ground. We have ours set 18 inches into the ground. Not sure we needed to do that but like I said, Doug likes things sturdy! * Do you want to see the 4x4 post in the corners when looking at the box from the top? If not, measure the 4x4 so that it is 2 inches lower than the top. When the dirt is in the box, you won't see the 4x4. If you don't care, and in fact, want the 4x4 to extend to the top, measure the 4x4 from the top. * Bolt the cut 4x4's flush with the ends of the 8 foot 2x8. After bolting to both ends, bolt one post in the middle. You can do this with the lumber flat on the ground. * By bolting to the ends of the long board, the width of the box will be less than 4 feet. This allows the gofer wire to go up the sides of the box. * If you have extended the 4x4's into the ground, now is a good time to set the boards into place. Measure to see if they are the appropriate distance apart and make sure they are level. * Bolt the top 4' board to the 4x4 post attached to the 8' boards. Then bolt the second 4' board below it. Do the second side. You now have a box! If you are hand watering, nothing needs to be done. If not, get your PVC pipe trenched under the box before the next steps. Don't forget to test it out. We stubbed it out into the corner of our boxes. Later we'll attach drip hose. * Lay down gopher wire cutting closely around the 4x4's and bending it up around the edges. If possible, staple it to the inside of the box. * Lay down weed cloth over the gopher wire making sure to cover the entire inside of the box. * Cut a 2x8 the entire width of the box. Place it in the middle of the box up against the sides of the middle 4x4's. Bolt to the 4x4's. This will keep the box from warping outward. Get a good organic planting mix rich in rock dust and green compost. In northern California, good fall veggies to plant include beets, broccoli, cabbage, carrots, cauliflower, garlic, kale, leeks, lettuce, onions and various root vegetables. Unfortunately I couldn't fill all of those in my new garden boxes but I did manage to get in quite a few.